We created a musical instrument that focuses on manipulating MIDI files. The basic idea of the instrument is to enable users to play musical variations of songs in almost infinite combinations of tempo, attack, decay and release. Three potentiometers correlate to three transformations based on ASDR, which stands for attack, sustain, decay and release. We altered the attack decay and release which allowed a person using the device to create the variations. Attack time is the time taken for initial run-up of level from nil to peak, beginning when the key is first pressed. We mapped 1024 values of the potentiometer to 0 – 1.5s. Decay time is the time taken for the subsequent run down from the attack level to the designated sustain level. We mapped 1024 values of the potentiometer to 0-1.5s. Release time is the time taken for the level to decay from the sustain level to zero after the key is released. We mapped 1024 values of the potentiometer to 0-1.5s. 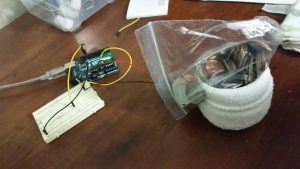 We hooked up arduino and processing using firmata and then used a minim library. The FSR correlated to a tempo transformation.With this setup, we are able to transform any musical file into a remixed, completely different song. // How does one use the audio generated by the computer itself as a fragment to loop over? // enable monitoring seems to do absolutely nothing for this cause. causes feedback. some interesting sound though. // sequecer is automatically hooked up to. // oops there wasn’t one. // we only care about NoteOn midi messages. 1) We plan to stick to our original scope of encouraging pre-linguistic children to brush their teeth. We will not be focusing on the technique they use for brushing their teeth. 2) In addition, we will focus on fleshing out the interaction to sustain routine. As we heard in feedback and also had an opportunity to observe (although very limited) that the age group of kids we are focusing on, get bored of the same routine very quickly. In order to address that and keep them engaged, we will be working on the same character doing different things everyday and even characters changing over time e.g Elmo appearing on the screen from different directions, Elmo appearing with Abby, Bob train appearing instead of Elmo/Abby etc. Elmo takes the child through a 3 minute routine which involves brushing teeth and gums, spitting, and finally, rinsing the mouth. Anytime during the 3 minutes, if the child stops brushing, Elmo becomes sad and prompts the child to continue brushing. After the 3 minutes are over, Elmo congratulates the child and invites the child to pose for a picture with him. Next, the laptop/tablet’s front camera comes on and captures the face of the child and creates a snapshot of Elmo and the child side by side. This snapshot is the child’s reward for brushing and is stored in memory. The child can accrue a streak of snapshots and subsequently get to unlock new characters. 4) On the hardware front, we will be using an accelerometer instead of the tilt sensor as the data stream we were getting as output from the tilt sensor (comprised of 1s and 0s) is quite hard to map to the physical movement and process further downstream. After trying various mechanisms, we picked this one with two legs made out of a single wire. The key in this arrangement is that the two legs are of different lengths. This enables each leg to alternately anchor and drag the motor while also drifting slightly sideways and the next step correcting for the sideways drift. 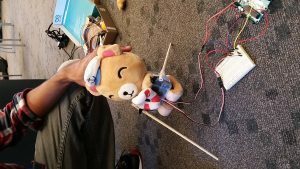 After being successful with the single motor and the mechanism, we tried using two motors to propel a stuffed toy supported on chopsticks. 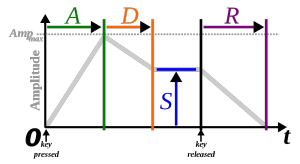 The idea being that the two motors would work in opposite directions – anchoring and propelling forward alternately (pic included below). For this lab, I built a pinwheel powered by the dc motor. While making the pinwheel wasn’t very hard, a lot of thought and effort went into controlling its stability and speed on the motor’s spindle. After a very few spins, the spindle makes the hole in the pinwheel bigger causing the pinwheel paper to lose contact with the motor which further results in loss of control over the motion of the pinwheel and the speed. To circumvent the problem, I used a twist tie to harness the motion of the spindle and transfer it onto the pinwheel. The arrangement is depicted in the photo attached. I then hosted the pinwheel and motor on a candy holder to allow for the pinwheel to get enough space to spin. I also placed a sticker on the top of the spindle hole to prevent the paper pinwheel from flying away. I found my thoughtless act in my TUI Kit. 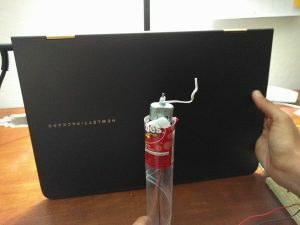 I have been using the styrofoam from the first lab for building diffusers to anchor my electronic components. 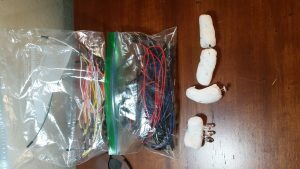 As the pic indicates, I plug my leds, photocells and diodes into it to keep them organized and keep myself from rummaging through the entire box when I need them. 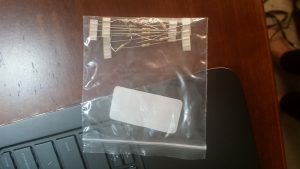 I also packed away my resistors in a small ziploc to keep them from running loose inside the box which used to give me a hard time finding them. 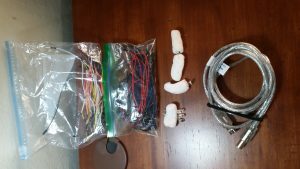 I use a hair tie to keep my Arduino wire manageable. I have separated my circuit building (colored) wires from the ground and power wires to save some time in pulling out wires. I hadn’t put much thought into most of these acts except for separating the wires based on color and only realized the rest of them when I started looking around for thoughtless acts. Going through my own thoughtless acts and those of others (on the various resources like Flickr, IDEO website, Pinterest etc on the class website), I have realized the importance of noticing people’s thoughtless acts and using them as inspiration during the design process. Taking this thought forward, if I were a designer designing a TUI kit for myself I would have made the solution better by using a sectioned box wherein each section would be customized in size and shape for the component that it would hold. I would also include important information like resistor color coding on the lid for easy access. For this lab, I decided to make a Halloween Candy meter that I will be needing very soon as Halloween is around the corner. My community is a very enthusiastic about trick or treating and as a result of that kids are able to amass an amazing amount of candy. This ends up being a nightmare for the parents. Many a times they accompany their kids and start nagging them to stop when candy levels get too high. The kids obviously do not enjoy this experience of being shadowed around when they are having fun trick-o-treating with their friends. All I need to think about now is to put together a costume which is way more fun than nagging a toddler around on a fun trick-o-treating night! Running shoes with gel technology have completely changed how I experience running. On one of my visits to the chiropractor, we started having a conversation about the importance of posture and balance for spine health. The chiropractor, an avid runner, shared his excellent experience with his new gel shoes and suggested that it might be a direction worth exploring. It is only after actually experiencing it for myself did I realize how it felt when gel absorbed and dispersed the energy from the shock and prevented it from transmitting up to my back. As a result, I do not feel tired after long walk and runs. My back had improved a lot and I wear my Asics Gel Running shoes every single day and cannot imagine my long walks and runs without them. If I could have it my way, I would have this technology in all my shoes. For the programming part of the lab, I created a visualization which starts with a circle at the corner of the screen and a rectangle in the middle. As force is exerted on the FSR, the circle on the left corner starts travelling diagonally across the screen and the edges of the rectangle start rounding. At a point, the circle hides behind the rectangle as if it were a coin that went into a pot/jar. This inspired mechanical part of my lab today. I used a pot to make contact with the FSR. Then I used a small ziploc bag full of coins to exert pressure on the FSR. The pressure could be measured by the number of quarters. Connect one end of FSR to 5V, the other end to Analog 0. 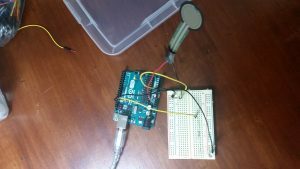 * determined by serial input from Arduino. 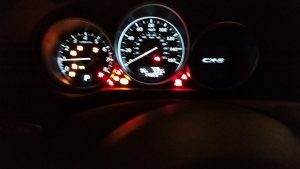 The Pousman and Stasko reading took me back to thinking about my car’s dashboard along the design dimensions of information capacity, notification level, representational fidelity and aesthetic emphasis (Posuman et al:69). It has a high information capacity displaying between 15-20 nuggets of information including the status of doors, seat belts, fuel tank, air pressure, next service due date etc. However, excellent execution along the dimensions of notification level, representational fidelity and to some extent aesthetic emphasis make the TUI very intuitive and pleasant to use. The Notification Levels of the fuel tank are a very good example of this excellent execution. It visually indicates the amount of fuel in the fuel tank and the number of miles remaining in an unobtrusive way. 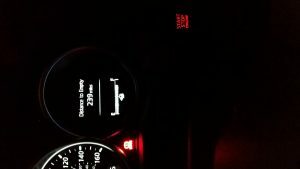 When the fuel level starts falling below a certain level, the display of icon of the fuel tank turns yellow. If not refueled after a certain point the yellow fuel tank icon starts blinking and if continued unfueled, it turns red and adds a beep to grab my attention. The iconic fuel tank and the scale metaphor that displays fuel status make for a good Representational Fidelity. On the final dimension i.e. Aesthetic Emphasis, I think the TUI is more functional while still looking decent but might not score too high on artistic measures. Last but not the least, I would have liked a well designed ambient system to monitor speed wherein, it would alert me in an attention grabbing style if I were going over or under the required speed limit of the road I am driving on. Additionally, it could make me aware in an unobtrusive way of the average speed of the general traffic on the road at that time. I think of all the dimensions of the ambient system design, the combination of notification level and representational fidelity requires the most thought from the designer to differentiate the functional smoothness of a TUI. 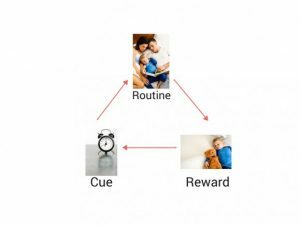 triggers to hook them into the interaction loop while also guiding behavior through cues and variable rewards to help inculcate positive habits. activities. For instance, it is difficult to explain to a 2yearold that brushing their teeth and bathing everyday are essential for keeping hygiene. Similarly, sleep is an acquired behavior as well, something that children learn over a passage of time. Over the years,experts have delved deep into how children learn – and advanced techniques for patterns of potty training and sleep training. Most of these techniques aim at guiding the child’s behavior through cues, routines and rewards. We feel that this project is at a unique intersection of behavior change, communication (non or early verbal), and education, all while serving a very specialized user group. It is particularly well suited to be a TUI as it is aimed at kids who aren’t savvy enough to use complicated apps. completion of the task the adult might give the child a token . 2) The child feeds the token to the pet and the pet does a happy dance. 4) The parent can remove them later and start over the next day.